This is my cousin's in-law's recipe. She taught me nearly 2 decades back. I liked this recipe a lot. I checked with her for the ingredients and procedure again recently and tried this recipe. I added coriander leaves for added flavour. My cousin doesn't use coriander leaves. 1. In a blender / mixer grind to a thick paste, prawns, garlic, clove, pepper and salt. Add a teaspoon of water if required. 2. Mix into the prawn paste finely chopped coriander leaves. 3. Slice the baguette 1/2 inches thickness circles. 4. Spread the prawn paste on one side. 5. Heat a tawa or a fry pan. Grease with little oil or butter. Place the prawn paste side of the bread down first. Let it cook and brown a little. This will take about 3 - 4 minutes. 6. Turn the toast over to the other side and toast it. 7. Serve it hot or warm. This can be served with soups or as starters or even for a main course. 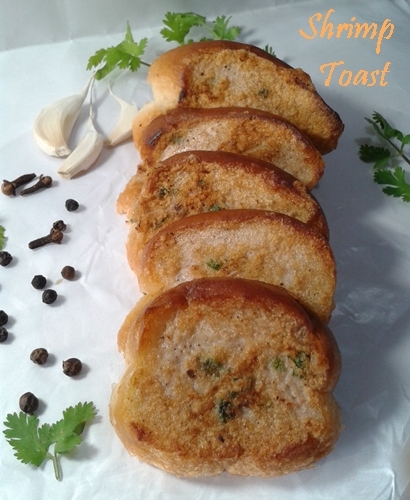 If you like, you can apply the prawn paste on both sides of the toast. Instead of coriander leaves, you can add any dry or fresh herbs for seasoning, like oregano, thyme, rosemary etc.